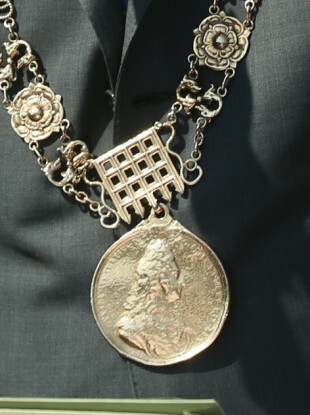 Chains of the Lord Mayor for Dublin. THIS WEEK, Taoiseach Leo Varadkar announced that the proposed directly-elected mayors for Cork, Limerick and Waterford will be paid €130,000. The public will be asked to vote on whether they approve of the idea of directly-elected mayors in a plebiscite, due to happen on the same day as the local and European elections on 24 May. “The salary is at that rate because it needs to be. This will be a serious, full-time job that will require a lot of energy, a lot of drive, 14-hour days,” Coveney told The Irish Examiner yesterday. We want to know what you think? Is it the right amount, or is it just too much money? Poll: Is the €130,000 salary proposed for directly elected mayors in Cork, Limerick and Waterford fair? Email “Poll: Is the €130,000 salary proposed for directly-elected city mayors fair?”. Feedback on “Poll: Is the €130,000 salary proposed for directly-elected city mayors fair?”.